Register by Wednesday May 17th for NEMBA Trail School North in Auburn ME on Saturday, May 20th. Registration is over for this event --j Sorry! This course is perfect for riders, trail enthusiasts, land stewards and land managers interested in learning about what makes for sustainable, enjoyable trails and how to take care of them. 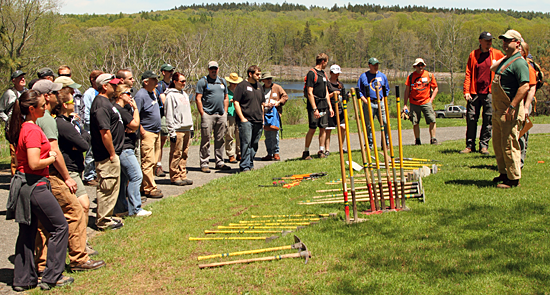 The course will include classroom presentations on the best practices of trail building and maintenance in the morning, followed by hands-on trail building clinics in the afternoon. Coffee, snacks and lunch will be included, and there will also be an option to purchase IMBA's trailbuilding textbook, IMBA Trail Solutions. The cost is $20. Please bring a check for $40 if you wish to purchace IMBA's book, Trail Solutions: IMBA's Guide to Building Sweet Singletrack. The course will take place in Auburn, and we'll be doing the hands-on clinics at Mt. Apatite.